Comarch TNA (Time and Attendance) is an innovative system for tracking and monitoring working time based on the cooperation of an original mobile application with Comarch TNA Gateway devices. Comarch TNA is an affordable working time management system. Its configuration makes it possible to fully cover the needs of your Company. To ensure the smooth operation of the system, you will need a Comarch TNA Gateway device and an application on your Employee’s smartphone. Placed at all the entry/exit gates of your Company, a Comarch TNA Gateway device enables the monitoring of work attendance. The solution can function as a stand-alone system or cooperate with other Comarch systems. It is also easily integrated with third party solutions. By choosing Comarch TNA, you will improve discipline and increase work efficiency among Employees. Clear-cut reports generated in the system will enable you to manage employee attendance. The solution acts also as an intuitive channel of communication to inform you about business trips, holiday leaves, and attendances or absences, thanks to which you will smooth information flow in the office. Improve working time management at your Company! A Comarch TNA Gateway device transmits an identifier which is read by the application installed on a smartphone (iOs- or Android-based) and recorded as an Employee’s activity on entering or leaving the office. The system can be used to handle different kinds of attendance in the workplace, holiday requests, and business trips. The Employer can also use it to generate reports compatible with external ERP systems or human resources and payroll systems of the Comarch ERP e-pracownik type. HOW TO START THE ELECTRONIC REGISTRATION OF WORKING TIME WITH COMARCH TNA? To start working with the service, at least one Comarch TNA device and the subscription need to be purchased. You can access the service immediately after purchasing the subscription, while the full functionality (including the possibility to automatically record entrance and exit hours) is activated upon receiving the Comarch TNA device (it is shipped within 5 working days from the order date). The device can be used at once. You can order any number of devices depending on the number of entry/exit gates to be handled. The subscription fee depends exclusively on the number of users, not on the number of gates (TNA devices). We propose a uniform and simple price offer which can be adapted to the Customer’s needs, and ensure low costs of implementation and maintenance. This price offer does not constitute an offer within the meaning of the Civil Code. Are you interested in Comarch TNA service or you would like to learn more? I consent to being contacted by representatives of the Comarch Group companies via the email address, to receive information on their latest offers or for marketing purposes. IMPROVE WORKING TIME MANAGEMENT AT YOUR COMPANY WITH COMARCH TNA! As soon as you receive Comarch TNA Gateway devices and perform simple configuration, you will be able to start the electronic registration of working time at once! 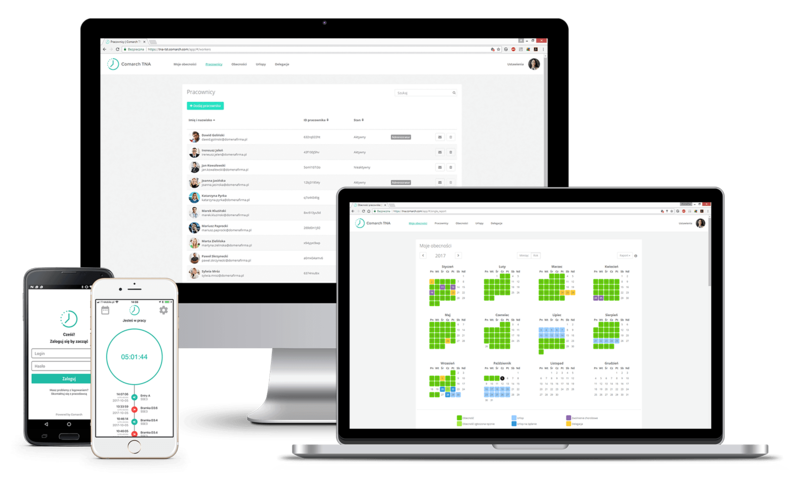 From now on, the system will register working time and monitor attendance, late arrivals, and absences, and you will be able to conveniently manage business trips and holidays.